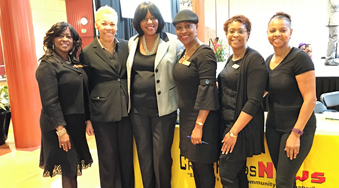 The ladies of the Decatur-DeKalb chapter of the National Coalition of 100 Black Women hosts and participates in many events each month that affect and are important to the people within our community. In addition to the many community events that the chapter participates in, the Decatur-DeKalb chapter also hosts several events at regular intervals throughout the year. With the money that is raised from these events, the chapter is able to help to fund various activities within our community, provide scholarships for the young ladies of the Legacy Program, and donate funds to the American Cancer Society and the American Heart Association. In the Spring, the chapter hosts a Wine Tasting event, with a portion of the proceeds benefiting the American Heart Association. In the Fall, the "Go Pink" Flapjack Breakfast is held at a local Applebee's Restaurant, and a portion of the proceeds goes to the American Cancer Society. Our biggest fundraising event is the Annual Pink & Black Ball and Silent Auction honoring cancer survivors in late Fall. The funds from this event help to support our local programs, generate income to support the Legacy Program through the Silent Auction, and a portion of the proceeds is donated to the American Cancer Society.